The Republic Bank Youth Link Apprenticeship Programme was started in 1986 and aims to equip participants with basic training and marketable skills in business-related disciplines in order to improve their career options. The participants will also engage in a series of development workshops aimed at fostering their personal and professional growth. In addition to promising the new apprentices an unforgettable learning experience, García-Brooks encouraged the Bank’s new, young charges to be fierce guardians and protectors of their personal character and to be men and women whose actions embody integrity. This message was underscored by the Bank’s Managing Director, Nigel Baptiste, who explained that the objective of the Programme was to give the participants the experience that would prepare them for any career path they decided to follow. 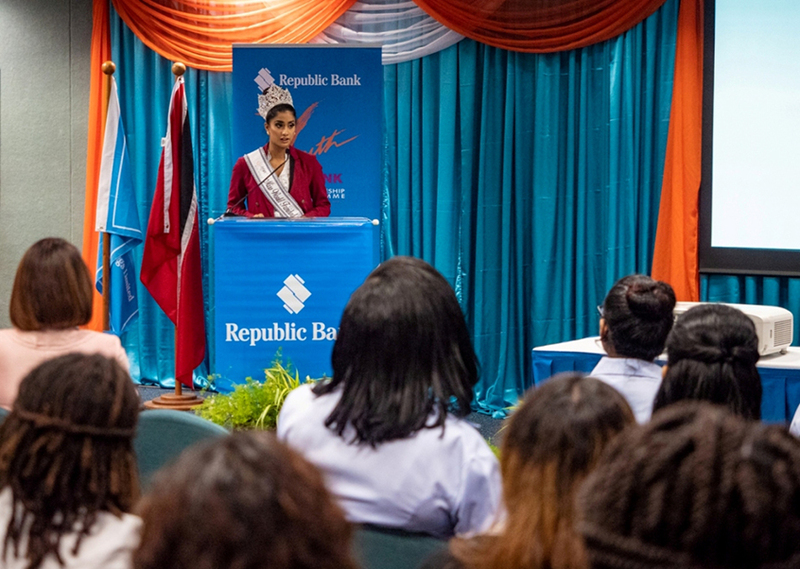 The apprentices also received words of encouragement and guidance from Republic Bank Branch Sales Manager and Youth Link alum, Latisha De Gannes, as well as Miss World Trinidad and Tobago 2018, Ysabel Bisnath. Drawing on her experience as an accomplished professional and a Miss World delegate, Ms. Bisnath encouraged the apprentices to dream big and to use the Programme as an opportunity to figure out what works for them personally and professionally. The apprentices themselves looked eager to soak up as much of the experience as they could and ready to begin their journey at the Bank. Undaunted by the challenge that lies before them, they appear ready to make their own mark on the Programme’s 33-year history.